Maybe it was the cartoonist Al Capp's way of balancing the beauty of Wolf Gal and Daisy Mae in his Li'l Abner comic strip, because in 1946 Capp introduced the "ugliest woman in the world", Lena the Hyena. She was so hideous that Capp could not bear to render her. 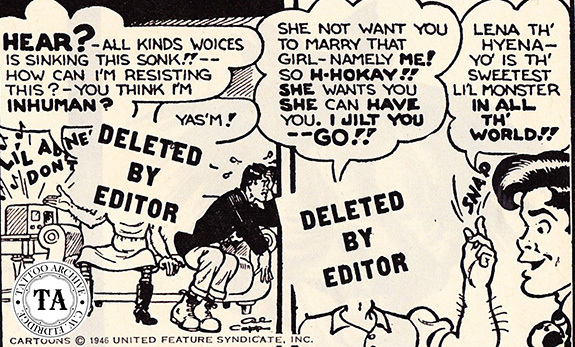 In his comic strip an editorial note covered her face and stated that it was there to protect the readers. In a stroke of genius Al Capp enlisted his readers (in 381 newspapers where his L'il Abner comic strip was seen) to send in their drawing of what they thought Lena looked like. Over 500,000 readers responded. Al Capp persuaded Boris Karloff, Salvador Dali and Frank Sinatra to judge the drawing and the winner was the cartoonist Basil Wolverton (1909-1978). 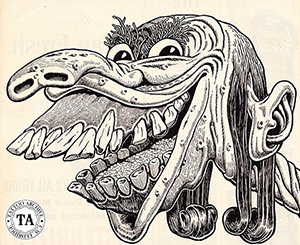 Basil Wolverton was born in Central Point, Oregon and as a young man he worked as a vaudeville performer, cartoonist and as a reporter for the Portland News. His first cartoon, Marco of Mars was published when he was 16. He never looked back. Over the years he worked for many comic publishers Marvel, Mad, Panic, Cracked, Ballyhoo and others. It was the prize-winning portrait of Lena, torn from Al Capp's L'il Abner comic strip in The Tribune. In case you've forgotten how she looked here she is in all her eerie unparalleled horror. Brooklyn Joe made a stencil from the portrait the Marine had clipped from the paper, and added it to his collection of standard designs. In case other walking art galleries might want to carry around a permanent portrait of the most unprepossessing gal in this or any other world. The Marine told Brooklyn Joe he was so fascinated by Lena that he wanted a picture of her that he couldn't lose and that he could carry around with him everywhere he went without it getting frayed around the edges. A tattoo job was the only solution. 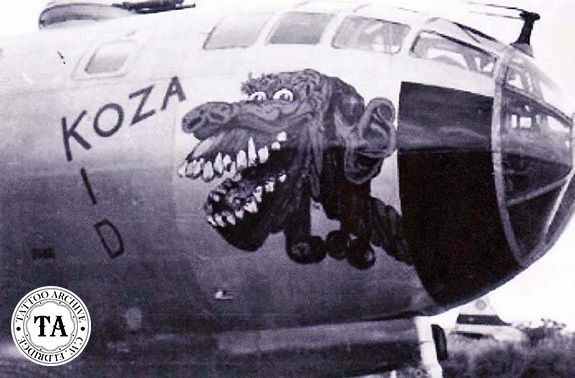 But Brooklyn Joe did more than solve a Hyena-happy Marine's problem when he did that tattoo job. He threw an old saw into reverse by proving that ugliness, as well as beauty is only skin deep." 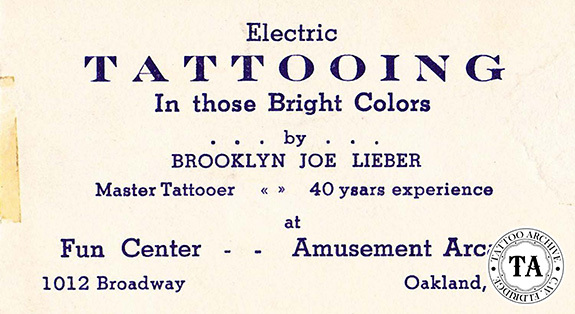 "Brooklyn Joe" Lieber (1888-1953) was a well-known tattooist who worked on Coney Island but is best known for the years he spent working in Oakland and San Francisco in the 1930's and 1940s. He was a big influence on a generation of tattooists including Sailor Jerry Collins.